This letter was updated by the authors on February 15, 2017. 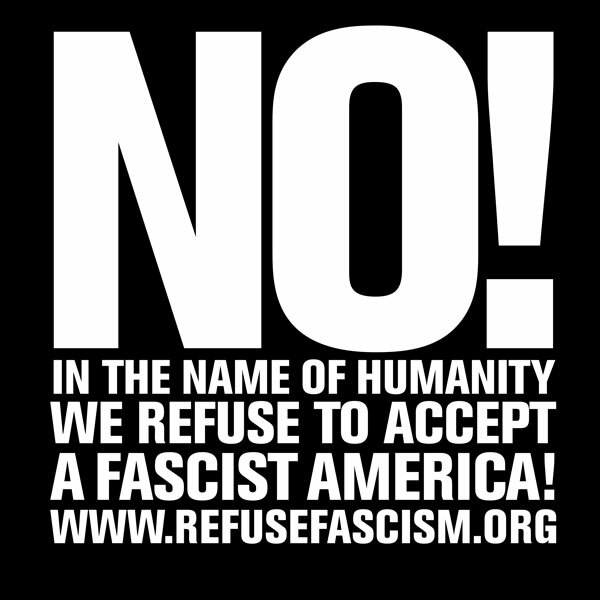 As the three people who kicked off refusefascism.org, we write today to all who have taken up the Call: In the Name of Humanity, We REFUSE To Accept a Fascist America, and to everyone following the campaign. We can say now, January 25, that the Trump-Pence fascist regime has basically assumed the reins of power. Every day they carry through some new outrage, be it in the realm of reactionary and repressive executive orders or appointments or proposed legislation, in threats of war or the re-legalization of torture, or in the almost equally dangerous assertion of their “alternative facts” (that is, their lies) as the truth. They surely have more, and worse, yet to come. Right now the ruling class is—some grudgingly and some enthusiastically—either going along with this or at most offering petty amendments. That does NOT mean that the possibility of ousting this regime through truly massive action is over, and that all people can do is work on local projects or hope for some pendulum swing somewhere down the road—while Trump-Pence carry out truly monstrous things and put the whole planet in jeopardy. Far from it. Precisely because this regime is fascist and a qualitative change from the “normal workings” of this system, and because millions of people—correctly—view this regime as utterly illegitimate, the possibility of crisis erupting at any time is great. There could be some new outrage—an attack from the Trump-Pence fascists on some section of the people which calls forth resistance and pushes people into the streets in a mushrooming sort of dynamic. There could be a conflict within the ruling class brought on by some move of Trump deemed by others at the top to be too risky, posing too much of a threat to the functioning of the established order and to what they see as their imperialist interests. We should all keep this in mind and remain tense and attuned to seize on even the hints of such possibilities. But the period when millions could be directly summoned into the street to prevent the consolidation of Trump-Pence is drawing to a close. The regime has achieved a relative stability, and things will be proceeding on that basis—of a fascist regime in power rapidly working to impose fascism. This is not the reality we worked and fought to bring into being, but it is the reality that humanity faces; we did not achieve our objective, and that has consequences. So it is important now to take stock. A little over a month ago, supporters of the Revolutionary Communist Party united with other people into refusefascism.org to initiate an effort to “stop the regime before it starts.” Together, we put out a Call for millions to recognize the fascist nature of the regime and to start taking the streets in early January. This was possible based on the anger manifested in the street demonstrations directly after the election and the continuing anguish even after those died down. Accompanying this call was the mission and plan that drew from history and an understanding of the basis for sudden “jolts” in society to make the case for HOW this might be done, why it could work and what would have to be done to make it happen. Hundreds of people took this up, thousands more supported it, and millions were reached with this basic message. Many other forces, with different strategies and goals but also strongly opposed to Trump-Pence, also began to mobilize and fight against the prospect of what this regime would do. People raised their voices and fought hard, many were arrested, and the legitimacy of this regime was called into question deeply enough that Trump still feels forced to continually (and defensively) insist on it. Yet both the necessary level of struggle (millions in the streets, night after night) and the necessary kind of struggle (breaking out of the confines of the normal channels) that refusefascism.org aimed for did not materialize. Then, this past weekend, two big things happened. On Friday, Trump was inaugurated and from the first minutes of his speech he made sharply clear that he would indeed rule as a fascist. On Saturday, millions of people worldwide turned out for the Women’s March to express their revulsion and opposition to Trump, in an unprecedented mobilization against the new regime. On the basis of these two new factors in the situation, we and others in Refuse Fascism still hoped to be able to call out sufficient numbers of those who had been mobilized, and get the dynamic going early in the week where this would snowball and create the necessary conditions where, despite the inauguration, the regime could not consolidate itself. (See "The world changed this weekend.") We knew, and stated, that this was a long shot, but it was a shot worth taking, given what is at stake. Had it succeeded, a huge danger would have been averted and a new point of departure would have been achieved from which to go forward in struggle. But now, more than midway through the week, it is clear that it has not. So we stand at a new juncture. The regime is in power, and moving quickly. At the same time, millions have registered their opposition and many are looking for a way to fight. Over these next few weeks, revcom.us will be covering the regime and the resistance to it with the same intensity and level of analysis that we have since the election. For the two bedrock points from which we joined with others to start this initiative remain true. One, that this regime is indeed fascist and as such poses a mortal threat and must be defeated. And two, that there are people—millions and tens of millions—who can potentially be mobilized to fight against it and who must be led to step outside the confines of politics-as-usual (including protest-as-usual) to actually OUST this horrendous monstrosity. Finally, moving into a new phase, it is important to look at what WAS done, as well as what was not. In the space of a month, people came together in refusefascism.org to develop and get out the Call to Act, and Mission and Plan that clearly assessed the danger and illegitimacy of this regime and sounded the alarm about its fascist nature. Refusefascism.org held emergency meetings in the week before Christmas, bringing together people of many different viewpoints, united around the shared goal of preventing Trump-Pence from ruling. Thousands of signatures were garnered, including prominent voices in society, and together we raised the money to print the call to act in the New York Times, the Washington Post, and elsewhere and get it before millions. We struggled for people to understand that what we face right now goes beyond all the truly horrible things that this regime has already begun to do and actually constitutes a fascist re-ordering of society with even more dire consequences, and got this understanding out in one form or another to literally millions. Refuse Fascism developed and popularized the NO! symbol. We united people to step out in so many different ways (in cultural programs, in forums, in school walkouts, getting out the wonderful videos and memes on social media, etc.) during the short time between New Year’s and January 20. Volunteers from refusefascism.org left their homes to go to DC weeks early to fight for this (even getting arrested and abused in doing so). Our message got into the media, from Fox News to the Amsterdam News in Harlem, from Pacifica Radio to Allhiphop.com and all kinds of other places, whether in in-depth interviews or contentious exchanges with reactionaries or the posters with the NO! symbol that popped up on the network and cable news and in the print media during the week leading into the inauguration; and people created from scratch a dynamic social media presence. Refusefascism.org brought together scientists, cultural figures, activists of different viewpoints, clergy of all different denominations and nationalities, designers, former political prisoners, scholars and many others in a beginning community of resistance—and we forged a model of relating diametrically opposed to that of Trump-Pence and their minions. As part of that, we discussed and wrangled over and debated out how we got to into this situation, about this system and its dynamics and how it could be changed and whether there is a whole other and better way we could be living. All this strengthens the basis from which to fight forward. That is no small thing. And that is what we now must do.